Two DSN stations used in VLBI measurement; how a third station serves as a “relay” to tie-together observations? The precision of a VLBI measurement improves with the length of the baseline. The location of the DSN stations provides baselines of 66% (Goldstone to Madrid) and 83% (Goldstone to Canberra) of the Earth’s diameter. The third baseline, Canberra to Madrid, is 98% of the Earth’s diameter but provides very limited mutual visibility (see module 301). 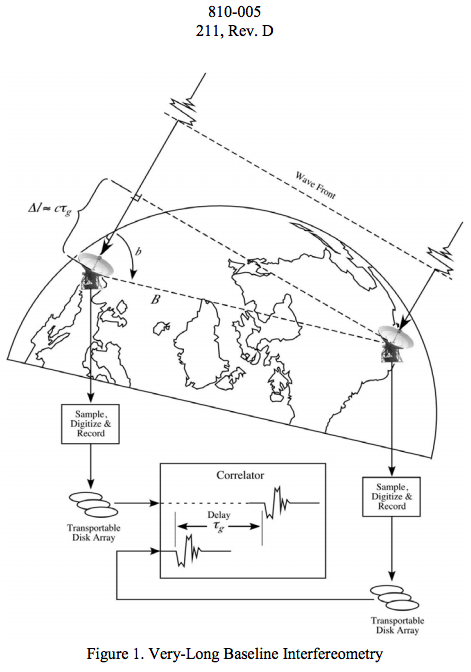 To mitigate mutual visibility effects, additional antennas are often involved in VLBI measurements allowing a station between DSN locations to serve as a “relay” to tie-together observations made in different portions of the sky during an observation session. I don't understand what function the third station performs. If A and B are the two DSN stations and I is the intermediate station, I can imagine AI and IB could collect additional data leading and trailing in time, when B or A are missing (no mutual visibility to AB) but I am not sure if that's what's happening here. It seems like waiting for the third DSN station C to appear would be an alternative. Browse other questions tagged deep-space-network radio-telescope delay-doppler vlbi or ask your own question. When was the idea behind the DESCANSO Book Series first conceived, by whom, and what is it's “mission”? How have/how will Indian ground stations be used for comms or tracking of deep space spacecraft? How many hours each day is Mars reachable by 2 of the 3 DSN complexes? What kind of ground-based radio astronomy is NASA's DSN used for? Who are the PIs?